A canonical turbulent boundary layer on a large flat plate has been investigated for Reynolds numbers 4 × 104 ≤ Reδ2 ≤ 5.5 × 104. This experimental investigation includes hot-wire measurements of the mean and fluctuating velocity profiles and of two-point velocity correlations in the wall-normal direction. Complementary Particle Image Velocimetry (PIV) measurements in a plane given by the streamwise and the wall-normal direction provide additional information about the instantaneous velocity field. The comparison between these two measuring techniques is of special importance since we are not aware of published PIV measurements at comparable Reynolds numbers. In addition, the validity of Taylor's hypothesis towards the high Reynolds-number range was investigated. 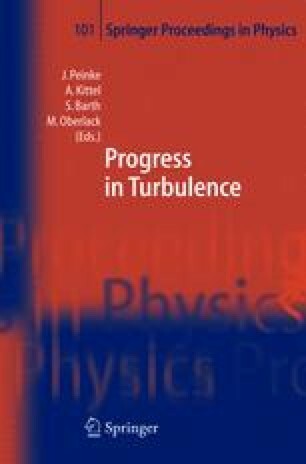 The project is part of the “High Reynolds Number Turbulence” group of the “Initiative of Turbulence” and also provides experimental data for other projects.